The Fillmore Senior Center is “CLOSED” February 17th in honor of Presidents Day. The Fillmore Senior Center is still closed while the floor is being refinished. "Bingo" is February, 14th. from 6:00PM - 9PM. Bingo is always on the 2nd & 4th Friday of the Month. The Fillmore Sr. Center will be open on February 10th, 2014. We look forward to seeing everyone Monday February 10th. Classes Monday are Tai Chi, Exercise Class, Sketching class; Tuesdays are Art composition Class; Wednesday Dr. Hara, Line Dancing, Busy Hands, Thursdays are Water color class; Friday there is Spanish Class, Exercise Class. The Fillmore Senior Center will still be “CLOSED” thru February 5th. while the City refinishes the floors. Monday, Tuesday and Wednesday classes are being moved to the Memorial Building at 511 2nd. Street regular times. FRIDAY, February 7th “BINGO” at 6:00 - 9:00PM For those who haven’t played Bingo, what is it & how is it played. It’s a game of chance played with randomly drawn numbers which players match against numbers that have been pre-printed on 5x5 matrices. The matrices may be printed on paper, card stock or electronically represented and are referred to as cards. Many versions conclude the game when the first person achieves a specified pattern from the drawn numbers. The winner is usually required to call out the word "Bingo! ", which alerts the other players and caller of a possible win. All wins are checked for accuracy before the win is officially confirmed at which time the prize is secured and a new game is begun. In this version of bingo, players compete against one another for the prize or jackpot. Seniors Craft Shoppe announces new applications open for 2014. Ventura County residents age 50 or older are eligible to apply for membership, which provides an outlet to sell their handcrafted items as well as volunteer and social opportunities. Applications are available during regular shop hours, 10 am-5 pm Monday through Saturday and 11-4 Sundays. The shop is located at 429 East Main St in downtown Ventura. Phone: (805) 643-3059. The Computer room is open to 55+ seniors Mon.-Fri. 8:30-12:45 “EXCEPT” when Dr. Hara is here, every other Wednesday. Call Rosemary @ 484-6028 x207 to schedule an appointment, either in Spanish or English. The Low Vision Class will also be available by appointment only now. The next class available is January 23, 2014..please call Lynn at 895-1176 to schedule an appointment. FRIDAY, JANUARY 24th “BINGO” at 6:00 - 9:00PM. Monday, February 24 & 25 AARP Mature Drivers Safety Course: 8:30am – 1:00 pm. This is a 2 part course. Driving is a skill that can and should be continually improved. This course can help you keep driving knowledge fresh and get the most out of your vehicle, while reducing risk to you, your passengers and others on the road. Taking a comprehensive driving improvement program will ensure that you have the most up-to-date driving techniques and understand the latest vehicle technologies. As you age, it is important to know and understand how to adjust for slower reflexes, weaker vision and other changes. Some of the benefits related to taking a safe driving course are: Potential discount on insurance premiums and getting up to speed on the latest in vehicle technology, such as anti-lock brakes (ABS) and lane-departure warning systems, and how they affect your driving. As a group, the oldest drivers are at a higher risk of having a serious collision per mile driven than any other age group except for those under age 25. Drivers in their late 70s have about the same number of injury-involved crashes per mile driven as drivers in their early 20s. And drivers age 85 and older are injured or killed in crashes at a higher rate than any other age group. This is due primarily to increased fragility that comes with age. Older adults are generally less able to withstand the forces of a crash, so they are more likely to become injured, compared with younger, stronger and fitter individuals. Older adults also don’t typically recover from injuries as quickly as they once did. FRIDAY, JANUARY 10th “BINGO” at 6:00 - 9:00PM. The Senior Center is “CLOSED” : Christmas Day, Dec. 25th & New Years Day, Jan 1st. FLOOR REFINISHING HAS BEEN RESCHEDULED TO A LATER DATE IN JANUARY. The Low Vision Class will also be available by appointment only now. The next class would have been January 23, 2014..please call Lynn at 895-1176 to schedule an appointment. 8:30 -12:45 Open Computer Rm. 8:30-12:45 Open Computer Rm 8:00 Senior Walk / 8:30 Open Comp. Rm. FRIDAY, DEC. 27th “BINGO” at 6:00 - 9:00PM. For those who haven’t played Bingo, what is it & how is it played. It’s a game of chance played with randomly drawn numbers which players match against numbers that have been pre-printed on 5x5 matrices. The matrices may be printed on paper, card stock or electronically represented and are referred to as cards. Many versions conclude the game when the first person achieves a specified pattern from the drawn numbers. The winner is usually required to call out the word "Bingo! ", which alerts the other players and caller of a possible win. All wins are checked for accuracy before the win is officially confirmed at which time the prize is secured and a new game is begun. In this version of bingo, players compete against one another for the prize or jackpot. The Senior Center is Closed Jan. 6th through Jan. 10th. The City is refinishing the floors. Lunchs will be served at the Memorial Building that week. The Center & Classes will resume there regular schedule starting January 13th. see you then. December 19th thru December 25th. The Center & Classes will resume their regular schedule starting January 13th. see you then. 8:30-12:45 Open Computer Rm. 9:00-10:00 Spanish Class 8:00 Senior Walk / 8:30 Open Comp. Rm. Friday, DECEMBER 13TH. “BINGO” at 6:00pm – 9:00PM. Next game is Friday: 12/27 same time. For those who haven’t played Bingo, what is it & how is it played. It’s a game of chance played with randomly drawn numbers which players match against numbers that have been pre-printed on 5x5 matrices. The matrices may be printed on paper, card stock or electronically represented and are referred to as cards. Many versions conclude the game when the first person achieves a specified pattern from the drawn numbers. The winner is usually required to call out the word "Bingo! ", which alerts the other players and caller of a possible win. All wins are checked for accuracy before the win is officially confirmed at which time the prize is secured and a new game is begun. In this version of bingo, players compete against one another for the prize or jackpot. The Senior Center will be Closed the entire week January 6th through January 10th. while the City is refinishing the floors. Lunch will be served at the Memorial Building that week. 8:30-12:45 Open Computer Rm. 9:00-10:00 Spanish Class is. 8:00 Senior Walk / 8:30 Open Comp. Rm. 12:30 - 3:00 Gourd Class. Friday, DECEMBER 13TH. “BINGO” at 6:00pm – 9:00PM. Next games are Friday: 12/27 same time. For those who haven’t played Bingo, what is it & how is it played. It’s a game of chance played with randomly drawn numbers which players match against numbers that have been pre-printed on 5x5 matrices. The matrices may be printed on paper, card stock or electronically represented and are referred to as cards. Many versions conclude the game when the first person achieves a specified pattern from the drawn numbers. The winner is usually required to call out the word "Bingo! ", which alerts the other players and caller of a possible win. All wins are checked for accuracy before the win is officially confirmed at which time the prize is secured and a new game is begun. In this version of bingo, players compete against one another for the prize or jackpot. 8:30-12:45 Open Computer Rm. 9:00-10:00 Spanish Class. 8:00 Senior Walk / 8:30 Open Comp. Rm. 12:30-3:00 Gourd Class also on Tues 12/17	. The Senior Center will also be “CLOSED” Christmas Day & New Years Day, but “OPEN” every other day. 12:30-3:00 Gourd Class also on Tues 12/17. Friday, November 22nd. “BINGO” at 6:00pm – 9:00PM. Next games are Friday: 12/13, & 12/27 same time. For those who haven’t played Bingo, what is it & how is it played. It’s a game of chance played with randomly drawn numbers which players match against numbers that have been pre-printed on 5x5 matrices. The matrices may be printed on paper, card stock or electronically represented and are referred to as cards. Many versions conclude the game when the first person achieves a specified pattern from the drawn numbers. The winner is usually required to call out the word "Bingo! ", which alerts the other players and caller of a possible win. All wins are checked for accuracy before the win is officially confirmed at which time the prize is secured and a new game is begun. In this version of bingo, players compete against one another for the prize or jackpot. The Gourd Class still plans on meeting at 12:30 -3pm the next Gourd Class will be on December 10th. The Senior Center will be Closed on Thanksgiving Day Nov. 28. 12:30-3:00 Gourd Class	Thursday Nov. 28 THANKSGIVING DAY CENTER IS CLOSED. 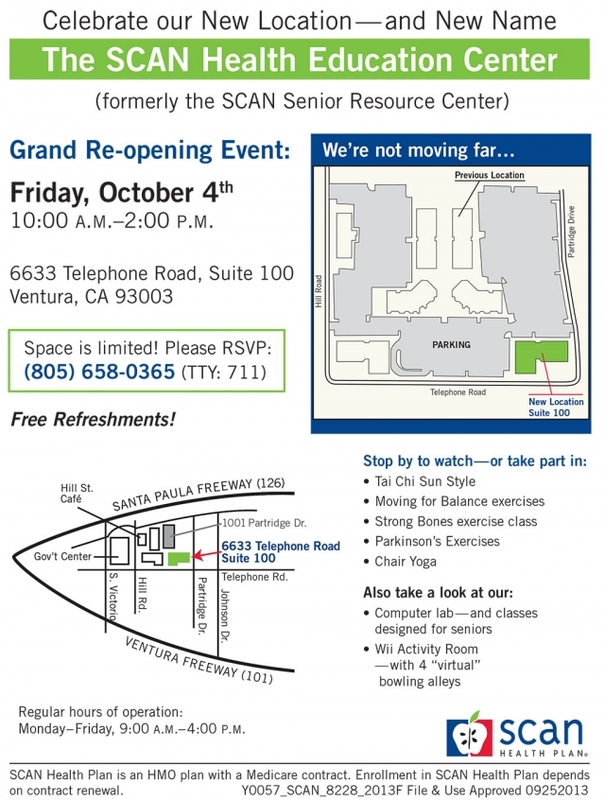 Friday, November 15th from 9:00 – 11:00 HI CAP “One Stop Shop for Medicare 2014” and Part D by Appointment Only. HICAP Counselor’s will run a Prescription Drug Plan comparison for you. Complete an Extra Help application to help with your prescription drug cost. Receive counseling on Medicare Advantage Plans, Medigap and Medi-Cal please call 1-800-434-0222 for appointments. Saturday, November 16th, 3rd Annual Craft Fair, 9am to 3pm find the perfect holiday gifts for everyone on your list at our annual Craft Fair. We have 16 crafters displaying their goods. This is a great opportunity to buy local while helping to support the Fillmore Senior Center. The Craft Fair is open from 9am -3pm and is located at 533 Santa Clara Street, in Fillmore. Friday, November 8th. “BINGO” at 6:00pm – 9:00PM. Next games are Friday: 11/22, 12/13, & 12/27 same time. For those who haven’t played Bingo, what is it & how is it played. It’s a game of chance played with randomly drawn numbers which players match against numbers that have been pre-printed on 5x5 matrices. The matrices may be printed on paper, card stock or electronically represented and are referred to as cards. Many versions conclude the game when the first person achieves a specified pattern from the drawn numbers. The winner is usually required to call out the word "Bingo! ", which alerts the other players and caller of a possible win. All wins are checked for accuracy before the win is officially confirmed at which time the prize is secured and a new game is begun. In this version of bingo, players compete against one another for the prize or jackpot. Friday, November 8th. AARP 4 HOUR Driving Class 9AM-1:00 This class is for those who have already taken one of the 8 hour, 2 part class. Call 524-4533 to sign up. The class is $12 for AARP members & $14 for non-members. 9:00-10:00 Yoga Class 9:00-10:00 Spanish Class 8:30-12:45 Open Computer Rm. Flea Market was a big success, Gloria’s talent of displaying all the items helped the shoppers to locate and find that special treasure others had donated and are now becoming new and special to someone else. If you missed out this year, maybe will have another next year. Friday, November 8th. AARP 4 HOUR Driving Class 9AM-1:00 This class is for those who have already taken one of the 8 hour, 2 part class. Call 524-4533 to sign up. The class is $12 for AARP members & $14 for non-members. The course is designed to help you: Update driving skills and your knowledge of the rules - and hazards - of the road. You will Learn about normal age-related physical changes and how to adjust your driving to compensate. Reduce your chances for traffic violations, accidents and chances for injuries. Get an insurance discount. Auto insurance companies in most states provide a multi-year discount to AARP graduates! Highlights of the course: How to maintain a proper following distance; The safest way to change lanes and make turns at intersections; The effects of medications on driving; Reducing driver distractions such as eating, smoking and cell phone use. Friday, November 8th. AARP 4 HOUR Driving Class 9AM-1:00 This class is for those who have already taken the 8 hour, 2 part class. Call 524-4533 to sign up. Saturday, November 16th, 3rd Annual Craft Fair, Tables are $15 each If interested call 524-4533 between 8:30 & 1:00 or leave a message. Friday, October 18th “BINGO” at 6:00pm – 9:00PM Back to Back Fridays this Month Due to the Flea Market. Saturday, November 16th, 3rd Annual Craft Fair, Tables are $15 each, Interested call 524-4533 between 8:30 & 1:00 or leave a message. 9:00-10:00 Yoga Class 9:00-10:00 No Spanish Class today	8:30-12:45 Open Computer Rm. Thursday, September 26th. Low Vision class will be offered at 10:00 AM. It’s important that you let us know your coming 524-4533 “Losing one’s vision can create a real sense of isolation, but it doesn’t have to” The Braille Institute offers “Free” programs and services to help anyone regardless of your visual impairment. This can include: cataracts, glaucoma, diabetic retinopathy, macular degeneration and more not just people with blindness. This is not replacing seeing the doctor, this is giving you support that will help visually impaired people live a more empowered, fulfilled life. Life skills will include cooking skills & kitchen management this month. There will be “NO” Low vision classes during November or December. BINGO STARTS SEPTEMBER 20TH.! 6PM to 9PM ! Friday, October 4th at 10:30 AM we will have our annual “FALL PREVENTION” Fall prevention may not seem like a lively topic, but it’s important. As you get older, physical changes and health conditions and sometimes the medications used to treat those conditions make falls more likely. In fact, falls are a leading cause of injury among older adults. Still, fear of falling doesn’t need to rule your life. Instead, Physical Therapist, Karen Swisher will educate you on Fall-prevention with easy strategies to help you feel more informed, comfortable and safe. Please bring your walkers &/or canes with you, even wheel chairs if you use non- electric ones and they will check them to be sure they are adjusted properly for you.